After the collapse of the Soviet empire, Russia crosses one of the most delicate phases of its history. While the Soviet Union was a superpower with global interests, Russia is now forced to summarize it’s claims to the status of a great power with regional interests. Breakup of the USSR, strategic withdrawal of Soviet troops to 1400 km from Central and Eastern Europe, wave of revolutions in 1989, redefinition of international relations, disappearance of bipolarity and the emergence of new centers of power created a geopolitical chaos that still has direct implications for european and world security. But Moscow could not accept that the USSR, which was built centuries, will disappear. It needed new methods to maintain control in the former Soviet states and one of these methods is what we know today as the Transnistrian dispute in Moldova. 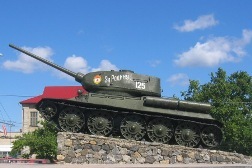 Republic of Moldova is one of the countries that have proclaimed their independence and emerged as an independent state and as a subject of international law due to the collapse of the USSR in 1991, and since then it’s facing with territorial separatism phenomenon, inspired and maintenated by Russian military presence in the country. Moldova is considered to be decisive to the regional geopolitical configuration redesign. Being a buffer zone among NATO and Russia, is compressed between two powerful force fields, with little chances of finding a way out. Because of Russia, of the Russian military presence on Moldova’s teritory and its regional interests; dynamics in Chisinau are not only political, but becomes a event with geopolitical accents. “Today, Moldova, despite its mall size and its opportunities, for Russia is one of the key points in the CIS area.” -this was writen in August 2000, in Nezavisimaia Gazeta. Transnistria is a part of Moldova’s territory, located on the Left Bank of the Nistru River. However, the term „Transnistria” is used more frequently as the name of the self-proclaimed breakaway „Moldovan Republic of Transnistria”, which has arised from the idea that there is a Transnistrian nation, that has the right of self-determination and even separation from RM. Although Transnistria is officially a part of Moldova, has its own government that leads the region, which is not recognized by anyone. Despite the diplomatic agreements with Russia which stipulated different terms of evacuation of the 14th Army from this moldovan territory – they were not implemented, moreover concrete measures are being delayed indefinitely by Moskow through every possible measure. Transnistria’s problem is a fundamental problem for Russian security, clearly defined by the resolution of Russian State Duma. Dniester River is the strategic line that separates the two greatest geopolitical space, the slavic one from the rest of the european world. 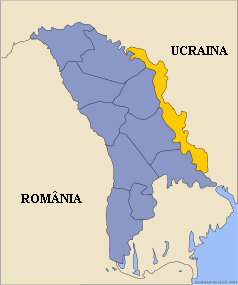 Controlment of the Dniester area was one of the main objectives of all empires which succeeded in Ponto-Baltic isthmus area due to its high zonal power. After detachment of Ukraine, loss of the Odessa region and the important military ports on the Black Sea, after the Azerbaidjean came under the influence of Turkey, after Georgia’s orientation to NATO, for Rusia, now more than ever, keeping Tiraspol has a strategic overwhelming significance, remaining the only bridgehead to the south-eastern Europe. Secessionist region includes 700,000 people or about 16% of the Moldova’s population, comprising one sixth of the Republic of Moldova’s teritory. Urbanization in Transnistria is about 65%, while in Moldova as a whole, this index remains at 47%. Untill the late eighties this region of Moldova generated a third of industrial production and about 90% of electricity supply. Transnistrian conflict and the self-proclaimed „Moldovan Republic of Transnistria” is the result of the separatist movement in the eastern region of RM, movement that arose in response to pro-Romanian trends from the early ’90s in Chisinau which was expected to lead to separation from the Soviet Union and to the unification with Romania. Separatist leaders stood up for keeping the Soviet Union and for entering Transnistria within the Union as an autonomous or independent from the Moldovian Soviet Socialist Republic member. In this order of ideas, Tiraspol’s movement managed to self-determinate in the same time with Chișinău, thereby demonstrating the real purpose of Transnistrian’s „independence” that was to stop Moldova’s secession from the Soviet Union. Leaders of separatist movement presented the ethnical specific of transnistrian population as an argument for demonstrating the need of Transnistria’s independence, that would constitute a transnistrian nation which has the right to self-determination. First of all, at the union census from 1989, nobody from Transnistria has defined itself as „transnistrean”, on the contrary, 40% of the people from the region called themselves moldovians. It is clear that transnistrian moldovians differed from the basarabians because of the higher level of russification, leading to a trenchant rejection of pro-Romanian events that took place in Chisinau, that were seen as a serious danger for the russians position in society. However, official policy towards ethnic minorities in the Republic of Moldova was based on tolerance – that was sometimes considered to be excessive, especially when compared with the situation from the other soviet republics. 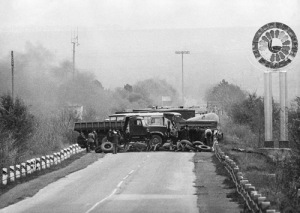 Among the so-called ethnic dispute, there are two more sources maintaining the roots of thease conflict: Russia’s post-cold-war ambitions to retain control over ex-republics through puppet regimes, and the huge profits made from illicit drugs and human traffick and smuggling of arms from the ex-USSR military hardware depots. The beneficiaries of such profits are the main advocates of the status quo in Transnistria, Abhazia and South Ossetia. While attempting to gain a camouflaged legalization of the secession, and eventually join these enclaves to the Russian Federation, the supporters of these regimes initiated a “confederation” project that would in reality dismantle sovereign countries like Georgia, Moldova, and Azerbaijan. Separatism movement was used with the aim of achieving geopolitical interests that usually harmonize with criminal ones. Transnistria has become a hub for criminal activities, drug smuggling, and arms and human trafficking to Western Europe and the Middle East. The year 1992 was marked by brutal Russian armed intervention against the young independent state. Russian Federation has organized, supported, incited, financed and encouraged this military aggression with the help of the Cossack paramilitary groups. The Russian military intervention in 1992 has violated all principles enshrined in the UN Charter, UN General Assembly Declaration of 1970 and Final Act of the Helsinki Conference. As a result of the military aggression against the Republic of Moldova, Russia took an important area of Moldova, liquidated legal organs of the State and installed anticonstitutional regime. The conflict in Transnistria finished with the establishment of an aberrant state entity and was generated by Russia’s refusal to accept independence and sovereignty of the Republic of Moldova and used to prevent a possible union with Romania. The presence of the Russian 14th Army in the Transnistrian region, under General Alexander Lebed, involvement of its troops and weapons in the conflict, have tilted decisively the balance in favor of separatist leaders from Tiraspol. Thousands of innocent citizens including elders, women and children who were murdered or subjected to torture and inhuman treatment were victims of this war of aggression. The fundamental Rights and freedoms were suppressed. Four innocent citizens of the Republic of Moldova, Alexandru Leșcu, Tudor Petrov-Popa, Andrei Ivanțoc and Ilie Ilașcu were illegally detained more than ten years in prison from Tiraspol. Tens thousands of people were forced to refuge inside and outside the country, to save themselves from terror. Romanian language and latin alphabet were forbidden in educational system and in the public life and all literature in Latin script was forbidden and burned. These atrocities and crimes against humanity have aroused indignation of the international community, who called Russian Federation to withdraw unconditionally its army by decisions of the OSCE Summits in Budapest (1994), Lisbon (1996), Istanbul (1999), by special resolution of the UN General Assembly in 2000, and also by OSCE Summit decision from Porto in 2002. But Russia has refused to honor this commitments, and Romanian population of Bessarabia remains trapped by Russian imperial forces. But the origin of this conflict must be sought in the expansionary policy of the Russian Empire, who occupied the territory of Transnistria in 1792 and of Bessarabia in 1812. The emergence of the Moldovian Soviet Socialist Republic from the act of occupation in June 28, 1940 was a direct consequence of the secret additional protocol between the Soviet-German pact – Ribbentrop-Molotov on 23 August 1939. “Russian policy has always been prevailed by imperial geopolitical interests; and territory of Bessarabia was always a strategic bridgehead, of which value the Soviet Union was aware. In the case of Union of Moldova with Romania, Transnistria would have automatically become the next strategic bridgehead. This is the leading point for this fight for Transnistria.” (Muntean, Anatolie, Ciubotaru, Nicolae, Românii de la Est: războiul de pe Nistru (1990-1992), Ager-Economistul, Bucureşti, 2004, pag. 122). So, we can say that creating „TMR” was an illegal act in terms of law, and according to historical and ethnic reasons, Transnistria does not have the right to self-determination. Violent methods used by separatist forces to establish the „statehood” of Transnistria come to confirm this fact. Moreover, on 21 July 1992, Russia imposed to Moldova an act which has arrogated itself the role of guarantor, mediator and peacekeeper of the armed conflict generated by itself. At that time, the status of mediator and guarantor was also assigned to Ukraine. During the last 20 years these two countries not only haven’t honored the claimed mandate, but also undermined the territorial unity and independence of our state. The insistence of Russian diplomacy ”to synchronize” the withdrawal of its military presence with the granting a special status for the occupied territories was the expression of a direct military-political pressure ordered from the outside of the internal organization of our state. The separatist leaders are citizens of theRussian Federation, many of them having ranks in the security services and in russian army. Over a hundred thousand people in these territories have Russian citizenship. Using the demographic weapon is one of the measures taken by Russia, for strengthening the presence of Russian element (also encouraging dislocations of Russian people in extreme areas of interest of Russia, including Transnistria). The number of Russian citizens living in Transnistria is growing fast. The presence of Russian troops in Moldova is the main cause of the failure of democratization of the country and its autonomous development. Transnistria is maintained in so-called state of „frozen conflict”, because no progress has been made for solving this conflict in the past decade, but everyone is aware that Moscow may ” heat up the situation”, at any time, if it interests are threatened. That’s why Bessarabia still remains somethere between East and West. This entry was posted on octombrie 4, 2011 la 8:18 pm	and is filed under Transnistria. Etichetat: Republic of Moldova, Russia, Transnistria. You can follow any responses to this entry through the RSS 2.0 feed. You can leave a response, sau trackback from your own site.